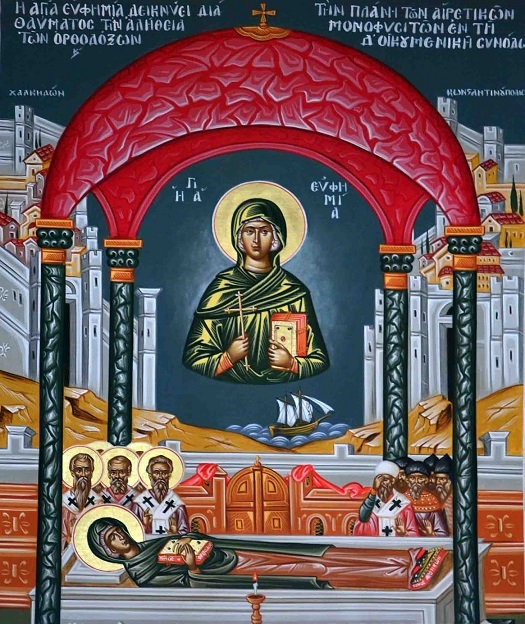 The holy Great Martyr Euphemia (Sept. 16) suffered martyrdom in the city of Chalcedon in the year 304, during the time of the persecution against Christians by the emperor Diocletian (284-305). One and a half centuries later, at a time when the Christian Church had become victorious within the Roman Empire, God deigned that Euphemia the All-Praised should again be a witness and confessor of the purity of the Orthodox teaching. 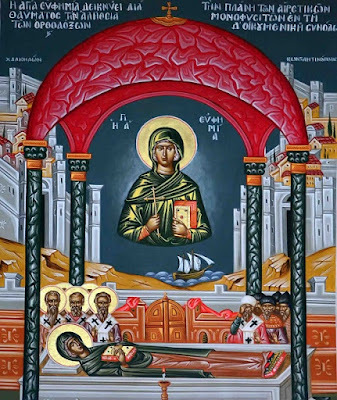 In the year 451 in the city of Chalcedon, in the very church where the glorified relics of the holy Great Martyr Euphemia rested, the sessions of the Fourth Ecumenical Synod (July 16) took place. The Synod was convened for determining the precise dogmatic formula of the Orthodox Church concerning the nature of the God-Man Jesus Christ. This was necessary because of the widespread heresy of the Monophysites ["mono-physis" meaning "one nature"], who opposed the Orthodox teaching of the two natures in Jesus Christ, the Divine and the Human natures (in one Divine Person). The Monophysites falsely affirmed that in Christ was only one nature, the Divine [i.e. that Jesus is God but not man, by nature], causing discord and unrest within the Church. At the Synod were present 630 representatives from all the local Christian Churches. On the Orthodox side Anatolius, Patriarch of Constantinople (July 3), Juvenal, Patriarch of Jerusalem (July 2), and representatives of Leo, Pope of Rome (Feb. 18) participated in the synodal deliberations. The Monophysites were present in large numbers, headed by Dioscorus, the Patriarch of Alexandria, and the Constantinople archimandrite Eutychius. After prolonged discussions the two sides could not come to a decisive agreement. 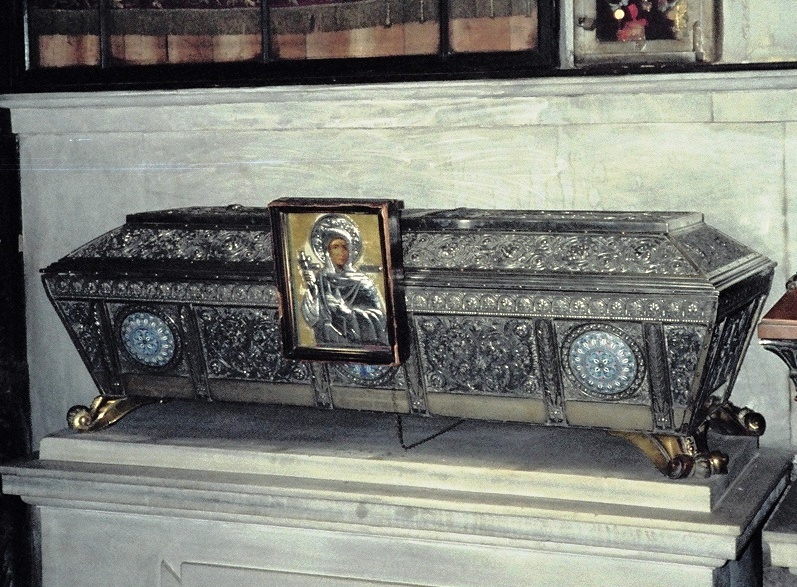 The holy Patriarch Anatolius of Constantinople proposed that the Synod submit the decision of the Church dispute to the Holy Spirit, through His undoubted bearer Saint Euphemia the All-Praised, whose wonderworking relics had been discovered during the Synod’s discussions. The Orthodox hierarchs and their opponents wrote down their confessions of faith on separate scrolls and sealed them with their seals. 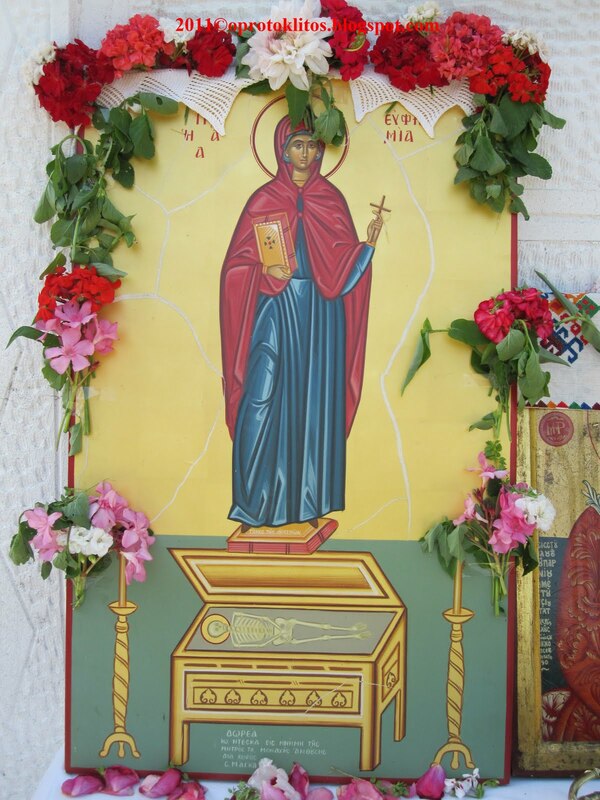 They opened the tomb of the holy Great Martyr Euphemia and placed both scrolls upon her bosom. Then, in the presence of the emperor Marcian (450-457), the participants of the Synod sealed the tomb, putting on it the imperial seal and setting a guard to watch over it for three days. During these days both sides imposed upon themselves a strict fast and made intense prayer. After three days the patriarch and the emperor in the presence of the Synod opened the tomb with its relics: the scroll with the Orthodox confession was held by Saint Euphemia in her right hand, and the scroll of the heretics lay at her feet. Saint Euphemia, as though alive, raised her hand and gave the scroll to the patriarch. After this miracle many of the hesitant accepted the Orthodox confession, while those remaining obstinate in the heresy were consigned to the Synod’s condemnation and excommunication. After an invasion by the Persians during the seventh century, the relics of Saint Euphemia were transferred from Chalcedon to Constantinople, into a newly built church dedicated to her. Many years later, during the period of the Iconoclast heresy, the reliquary with the relics of the Saint was cast into the sea by order of the Iconoclast Emperor Leo the Isaurian (716-741). The reliquary was rescued from the sea by the ship-owning brothers Sergios and Sergonos, who gave it over to the local bishop. The holy bishop ordered that the relics be preserved in secret, beneath a crypt, since the Iconoclast heresy was continuing to rage. A small church was built over the relics, and over the reliquary was put a board with an inscription stating whose relics rested within. When the Iconoclast heresy was finally condemned at the holy Seventh Ecumenical Synod (in the year 787), during the time of Tarasius, Patriarch of Constantinople (784-806) and the emperor Constantine VI (780-797) and his mother Irene (797-802), the relics of the holy Great Martyr Euphemia were once again solemnly transferred to Constantinople.